Bodie Kendrick is a good ol’ boy in a bad job, and Wayne D. Dundee knows the character inside and out. In this third adventure of the bounty hunter, Bodie slides into the narrative with the comfortable fit of a well-worn boot. 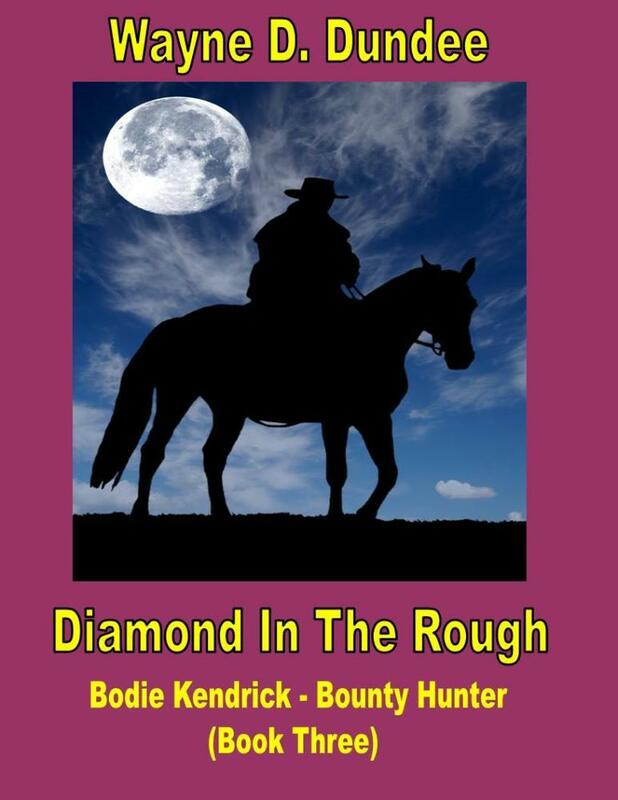 Dundee knows the Western crowd and what they love, so he kickstarts Diamond in the Rough with some all-out action that’s exciting and reminded me a lot of a good Louis L’Amour Western novel. Dundee maintains the action throughout the novel too, but then he adds in some Old West history, a fantastical bit of lore that fits perfectly, and some betrayals that spice up the mix. I have to admit, when I got to the part about the camels, I just had to laugh. I remember an old Western movie named HAWMPS! that centered around the U. S. Camel Corps. The movie featured James Hampton, Slim Pickens, Denver Pyle, and Jack Elam, all of whom are known to anyone who grew up watching Western movies. HAWMPS! was a comedy, but Dundee plays the action more straight. There’s plenty of humor, but the stakes are never less than life or death, with Bodie Kendrick’s neck staying firmly on the chopping block. The mythology of Dundee’s Red Ghost is based in legend as well, only the author tidies up history and gives some answers to where that legend came from and who that mysterious rider was. Dundee is an easy-to-read writer. He has great narrative, lots of dialogue, and larger-than-life characters that leap off the pages. The author enjoys his stories, and you can feel that on every page. Although this is the third Bodie Kendrick book in the series, you don’t have to read the other two in order to appreciate this one. Dundee provides adventure, and Bodie is a man you want to ride with. This entry was posted on July 13, 2013 at 12:50 pm and filed under Adventure,ebook,series fiction,Western. You can follow any responses to this entry through the RSS feed.